December always seems to be the months we really get into theme production mode, so we are super happy to show you our two latest Photography blog themes Neubau (see the Neubau live demo) and Werkstatt (see the Werkstatt live demo) today. Both themes are quite different, Werkstatt is a horizontal-scrolling theme with a very clean, minimal design. It’s a great theme to feature individual images on a website, the design feels very clear and calm. Neubau has an open, three-column Masonry grid layout. Posts can be featured as sticky posts at the top of the blog front page. Both themes work best with a lot of pictures. Werkstatt is a great theme to also show images only on a website (e.g. for a photography showcase), Neubau is a great theme for photography, travel oder food blogs. 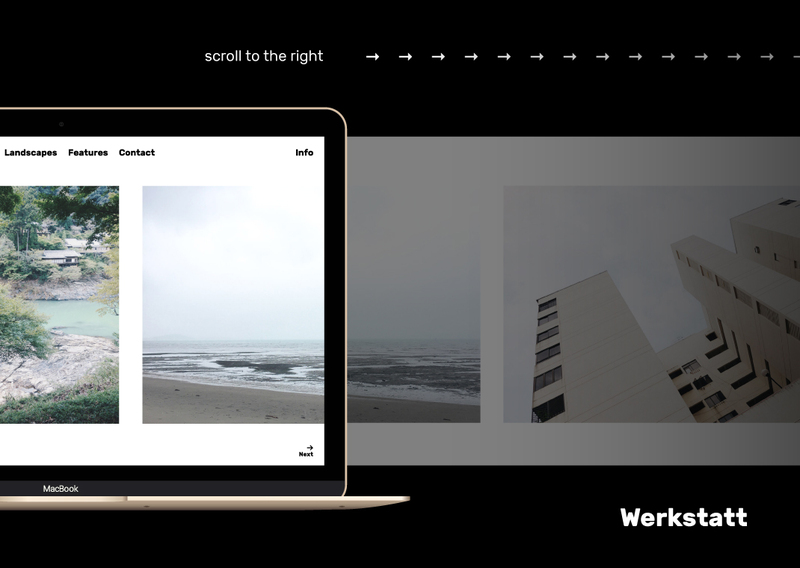 Werkstatt has a unique, responsive horizontally-scrolling theme layout, so you can show your images, in a clean and minimal way without much distraction. On single posts you can show images in a big image size (up to 1600px in width) or include image galleries. 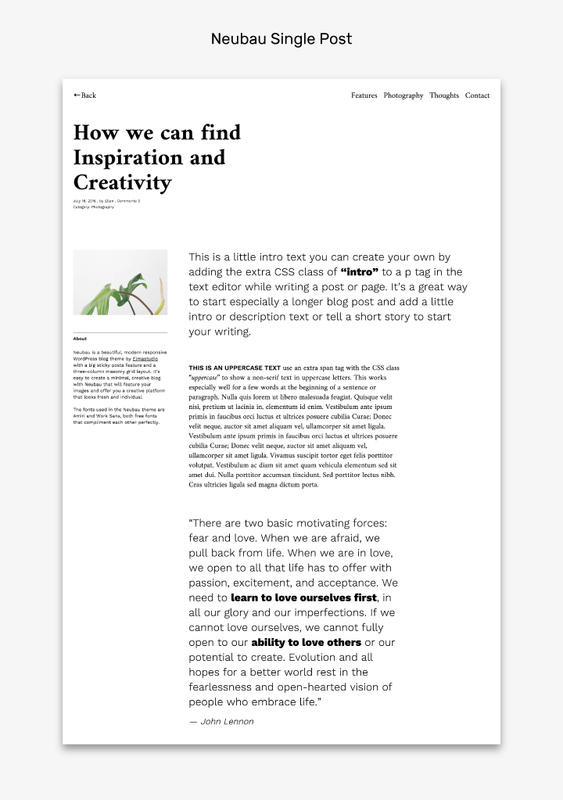 A further Werkstatt theme highlight is the open, grid layout on archive pages (e.g. category overviews). The grid layout makes archive pages more attractive for your viewers and it changes up the view for posts filtered by categories, tags or search terms. Widgets can be included in a four-column overlay widget area that can be opened via the fix-positioned “Info” button. The cool 4-column widget area offers lots of space for your widgets. 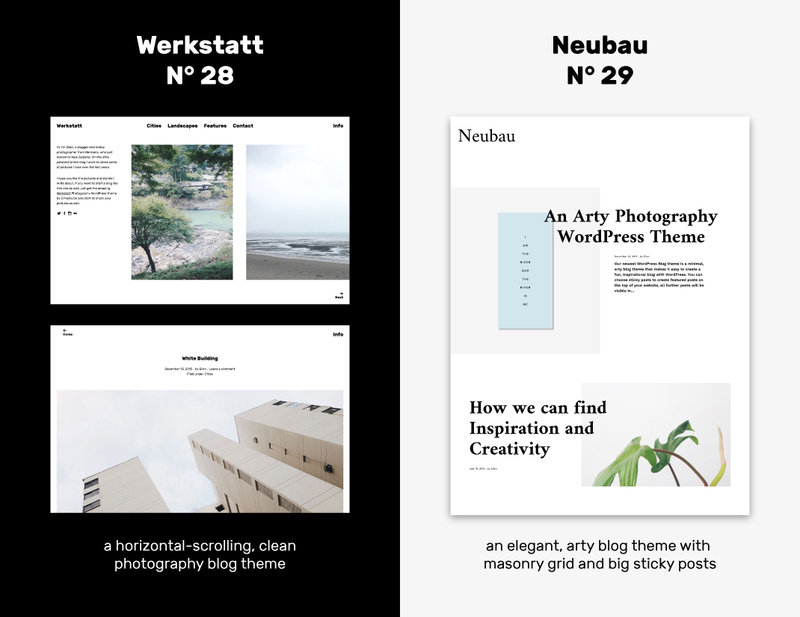 Neubau is a blog theme with a modern masonry grid layout on the blog front page. You can use Neubau for a number of websites, like photography, travel or food blogs or any blogs that feature a lot of images. Single posts then offer a lot of space for longer texts, quotes, further images, image galleries or videos. A special theme highlight are big sticky posts on the blog page, so you can feature some of your best posts. On single posts you can also include widgets in a left-align sidebar below your Featured image. Next to the posts widget area, Neubau also comes with a three-column footer widget area. A single post in the Neubau theme. We hope you really like our newest two themes and have fun using the themes on your blogs or even start a new blog with one of themes. If you have any questions or suggestions on how to improve the themes further or if you find any bugs, please just let us know by writing a comment below. We would love to hear your feedback! Oh gosh I love the new themes! They are so great to look at…thank you Elma studio! They are both so beautiful! In Neubau, it seemed that my browser needed to be quite wide to accommodate the layout, otherwise there is a large blank space at the top. I’d really like to use this theme, is there a way around this? thanks so much for your feedback, so happy you like the themes! I’m already working on a small first update for Neubau, I will fix the issue in the update (I think it has to do with the fade-in effect of the posts). HI” Love your themes, im currently using onigiri but have no idea on how to make it like your demo..so that one can have all the images/daily posts that are posted on one page and hoover over so a title appears and then click on the picture to read the content….Right now i just have a simple scroll blog that you haveto click on the title ontop of the image to get to the single page where you can leave comments. Thats why im considering buying Neubau instead … but im wondering will it be hard for me to trasfer the blog to a new theme? Im super new with all this!! or can i make the onigiri work the way i want it to? Please help me figure out how can I make a single-column for the first two posts (Neubau theme) as in the first photo where you present the theme. So, the first two post to appear as single-column and wider and then as going down three-column.